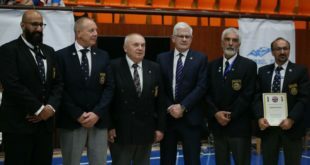 We in the KFK congratulate the British Kyokushinkai Karate on a successful 36th British Open (4th Cup of Europe) with over 120 entries and over 19 countries. 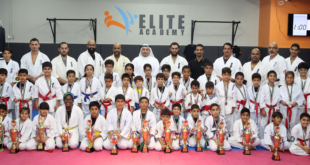 Shihan Alex Kerrigan and Shihan Liam Keaveney was promoted to 7th dan by Hanshi Steve Arneil the KFK congratulate them on this promotion and thank them for all the hard work and support they have given to the development of Kyokushin in Kuwait. Kyokushin guest of the BKK at the tournament were Mr. Alexey Gorbilov of Kyokushinkan Russia, Shihan Tsuyoshi Hiroshige, Shihan Loek Hollander, Mr. Sergey Suvorov and Shihan Fernando Perez. 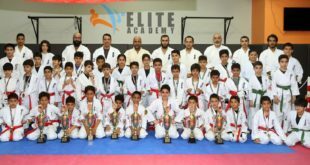 They also have Gathered for a meeting with the BKK on the 14th October at Hilton Metropole, London to discuss the KWU tournament rules and proposal for 2013 events. 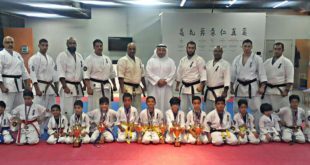 During Shihan Alex Kerrigan visit to Kuwait on July 2012 he held Referee/Judge Knockdown Course and as a result of successfully completing it Senpai Ali Al-Manaseer and Senpai Talal Al-Manaseer took part as Judge. We would like to thank Hanshi Steve Arneil and the BKK for a great event and wish them the best of success in the future.